How to Rip DVD to USB OTG Compatible Phones, Tablets, Storage Devices, etc. How to Rip DVD to USB OTG Compatible (Samsung, Sony, HTC, etc.) Phones/Tablets, Storage Devices, etc. As the title indicates that this article will focus on how to rip DVD to USB OTG compatible devices, home-made or commercially released DVD, with a top-notch DVD ripper, aiming to help play back the digital DVD content on USB OTG laptops, smartphones, tablets and more devices directly. And you can play the DVD movies in USB storage devices on mobiles without transferring via a USB OTG cable. But before any further, you may want to figure out what is USB OTG, how to use USB OTG, and other problems. How to Rip DVD to USB OTG Compatible Devices? WinX DVD Ripper Platinum – Fast rip any DVDs to any USB OTG supported mobile phones, laptops, tablets, storage devices, etc. 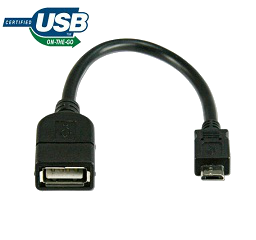 USB OTG, also known as USB On-The-Go, is an extension of USB 2.0 specification for enabling peripheral devices to be cabled together via USB without a computer in between. OTG creates a "dual-role" device that can function as host or peripheral. When OTG devices are connected to each other, an automatic negotiation makes one the host and the other the peripheral. With a USB OTG cable, you can connect your mobile phone to a printer, a scanner, an external HDD, a flash drive and other USB OTG compatible devices. In this sense, if you have ripped and put a DVD movie to a USB stick, you can watch the DVD digital content on your mobile phone directly without transferring the content to your phone before, as long as the USB stick and your mobile phone are connected via a USB OTG cable. On the one hand, you are free from laborious transferring procedures. On the other hand, it's a good way to save the storage space of your mobile phone. Do your devices support USB OTG? As stated above, USB OTG does make our life easier. If you want to experience the convenience brought by USB OTG, you should firstly check whether your device supports USB OTG or not using USB OTG Checker or other apps. Nowadays, many phones and tablets from Samsung, Sony, LG, HTC, Toshiba and more are compatible with USB OTG. Since USB OTG is a good way to enjoy movies music media files while saving time, money and energy, why still hesitate to rip DVD to USB OTG compatible devices? To rip DVD to USB OTG compatible devices, you should have a DVD ripper, preferably a piece of DVD ripping software that can rip both regular and copy-protected DVDs on PC and Mac without any glitches. And WinX DVD Ripper Platinum is just what you need. It is a professional DVD converter which can rip any DVDs including commercially released DVD movies from Disney, Warner Bros, Paramount, etc. It is badly easy to rip DVDs to USB OTG devices supported file formats like MP4, as well as AVI, WMV, MOV, M4V, FLV, WebM and so on. Following the guide below, you can rip DVD to USB OTG compatible devices on Windows (10, 8, 7, etc.) and Mac (OS X 10.10 Yosemite, 10.9 Mavericks, etc.). Download, install, and launch this DVD ripper for USB OTG devices to get DVD ripping started. Step 1. Input DVD source. Insert your DVD disc to the DVD-ROM, click "DVD Disc" button in the top menu of this DVD ripper, and then select the target DVD source for converting to USB OTG devices. Step 2. Choose output profile for your USB OTG device. There are a large number of output profiles including file formats accepted by PC, Mac, iPhone, iPad, Android Samsung, Sony, HTC, Microsoft, etc. But to make the ripped DVD file compatible with a wide array of devices, USB OTG supported or not, "MP4 Video" under the "General Profiles" category is highly recommended. Step 3. Specify destination folder to store ripped DVD digital file. It is entirely up to you to determine the destination folder. You can connect your USB OTG compatible mobile phone or a flash drive to the computer, and choose the name of your device as the destination, or choose a folder simply from the computer. Step 4. Begin ripping DVD to USB OTG compatible device. Click the RUN button, then you will be taken to the process of ripping DVD to USB OTG compatible device. Thanks to the advanced technologies, such as the support for multi-core CPU (up to 8), it can deliver digital file at super fast speed. After you have ripped DVDs as digital files, you can transfer them to USB OTG compatible devices like Samsung Galaxy S5 for playback, or store them in a storage device and play them on USB OTG compatible devices via a USB OTG cable when necessary. 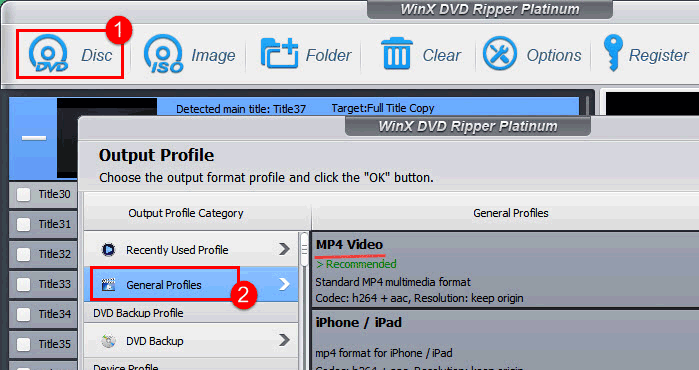 More than DVD to USB OTG: WinX DVD Ripper can rip any DVD to MP4, AVI, WMV, MPEG, FLV, MTS, MOV, and other mainstream videos for saving on local or external hard drive, USB, MicroSD card, iPhone, iPad, PSP, Android/Microsoft and other devices playable windows on Windows and Mac OS for different uses. It also clones a DVD to ISO image file/DVD folder/MPEG2 file extremely fast without quality loss with with Super Encode Engine, Hyper-threading tech, etc. The bonus features include bypassing DVD copy protections for personal use, adding own SRT subtitles to DVD subtitle track, merging movie titles, cropping and trimming, and flexible settings for advanced users. How to Convert DVD to MOV with Free DVD Ripper Mac?